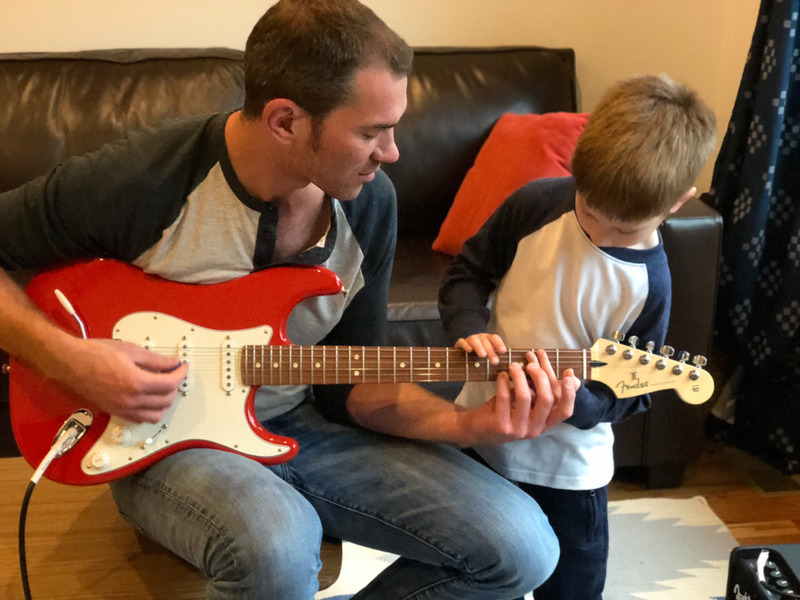 The author and his son playing the Fender Player Series Stratocaster. Fender's new Player Series electric guitars are some of the most affordable professional-quality instruments available today. The company has been making the Stratocaster for more than 60 years, with the first model released back in 1954. The Player Series feature classic styling that nods to the instrument's long heritage as well as new features such as dual-tone control knobs and a 22-fret neck. You know the Fender Stratocaster electric guitar. Even if you're not a guitarist, you know about this instrument. Frankly, even if you're not all the into music, you've almost surely heard of it. And when you picture an electric guitar, it probably looks like a Stratocaster. Hendrix played one. So did Lennon and Harrison. So did Clapton. And now, thanks to the new Player Series of guitars from Fender, so do I. Many top-quality electric guitars sell for thousands of dollars. Being an amateur player and with mouths to feed and such, there was no way I'd ever shell out that much, even for a great guitar. So for years, I was relegated to my trusty acoustic. And that was fine, but acquiring a superlative electric axe took things up to 11. What changed? The price, basically. In 2018, Fender launched its Player Series, a slate of instruments including multiple guitars and basses all priced well under $700. In case you're not sure, let me be clear: That's a great price for a great guitar. Player Series Stratocasters are designed for comfortable, easy play. The contoured shape of the solid alder wood head allows for ideal arm placement and rests comfortably on your lap, while the maple wood 22-fret neck (that's one more fret than standard) offers excellent note range. Having rather large hands, I also appreciate the fact that the "medium jumbo" frets and neck are relatively wide, yet I can still comfortably play chords requiring close finger position. As for the color, I went with a classic bright red, but the guitar comes in more than a half dozen colors with a luscious gloss polyester finish. So the guitar looks good, and it's comfortable and easy to play. But what makes it sound so amazing? Part of the sound quality comes thanks the high-quality wood and careful craftsmanship thereof, but hey, this is an electric guitar, people. The trio of Player Series Alnico 5 Strat single-coil pickups, which are set by the bridge, middle, and neck, are responsible for getting the fine sounds produced by a well-made guitar channeled through an amp and out to our ears. And in case you're thinking "That's great, but what's a pickup?" it's a transducer that converts the mechanical vibrations produced by the strings into an electrical signal that can be sent to an amplifier. They literally pick up the sound and carry it to the speakers. Wait... ok, no, not literally "pick up," but capture and convert - whatever; you know what I mean. Let's move on, because I've got jams to play. 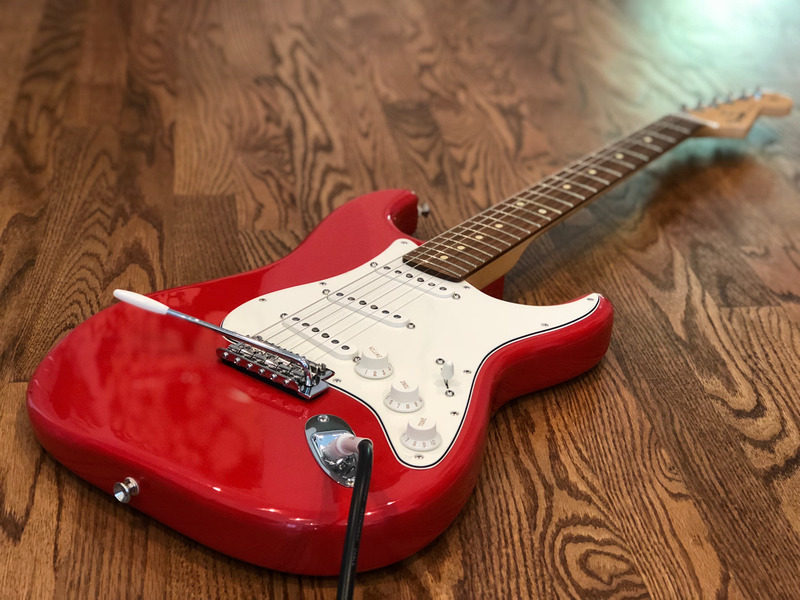 A five-position pickup switch and dual-tone control knobs give a guitarist ample control over his or her sound, and of course that whammy bar is there when you need to bend a note for extra awesome, as my son so often does. 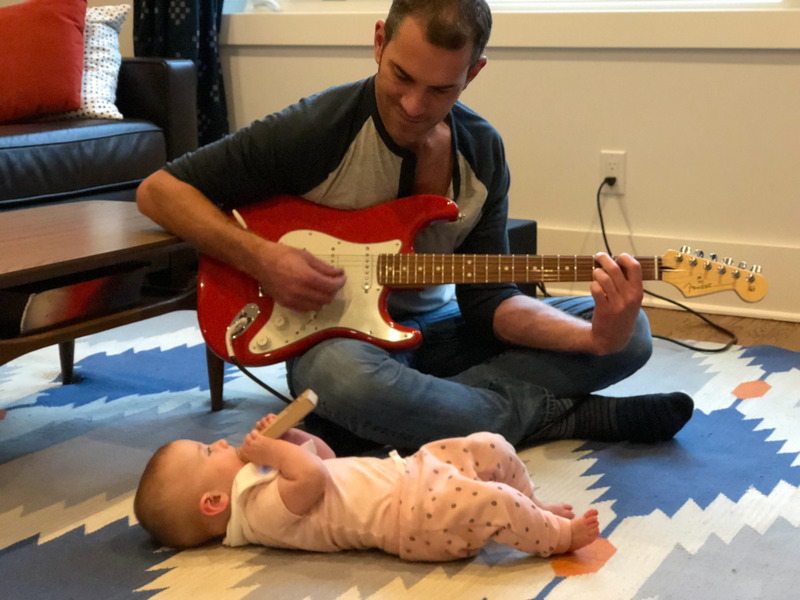 While I may be only a middling player, at best, I'll tell you that my take on Creedence songs have never sounded better, and now I've even got some backup from my infant daughter on the shaker.